Stuart Broad took 8-15 as Australia were bowled out for 60 and Joe Root hit a century as England put themselves in a strong position to win the Ashes on the first day of the fourth Test. Broad passed 300 wickets and equalled the fastest Test five-wicket haul - 19 deliveries - as the tourists were dismissed in 111 balls at Trent Bridge. It was the shortest first innings in Test history. Root's unbeaten 124 helped England to 274-4 at the close, a lead of 214. Alastair Cook scored 43 and Jonny Bairstow made 74, sharing a fourth-wicket stand of 173 at more than five runs an overs with Yorkshire team-mate Root. Victory will give England an unassailable 3-1 lead in the five-match series and see them regain the urn they lost courtesy of a 5-0 whitewash in Australia in 2013-14. Broad, bowling the first over, had Chris Rogers caught at first slip by Alastair Cook with his second ball - claiming his 300th wicket and inflicting a first duck in 46 Test innings on the Australia opener - before Steve Smith edged his sixth delivery to Joe Root at third slip. Australia scored 10 runs in that first over, a sixth of their eventual total. Mark Wood, returning to the England side after missing the third Test win at Edgbaston, struck in the following over when David Warner was caught behind off an inside edge. Broad had Shaun Marsh held by Ian Bell at second slip in his second over and Adam Voges spectacularly taken one-handed by a diving Ben Stokes at fifth slip in his third. Australia captain Michael Clarke became Broad's fifth victim, slashing to Cook at first slip from Broad's 19th ball, equalling the number of deliveries needed by Australia's Ernie Toshack to claim five wickets against India at Brisbane in 1947 - although Toshack did not open the bowling. Steven Finn bowled Peter Nevill to reduce Australia to 33-7 after 9.2 overs, before Broad took the last three wickets as Mitchell Starc and Mitchell Johnson edged to Root at third slip and Nathan Lyon was held by Stokes at sixth slip. There were still 20 minutes until lunch. Australian commentator Jim Maxwell: "This is one of the most embarrassing batting performances in Test history." Former England batsman Geoffrey Boycott: "Australia are just poor at batting when the ball moves. It hasn't moved as much as it did at Edgbaston. Some of the shots have been pathetic. Stuart Broad has just won the game - it's over." 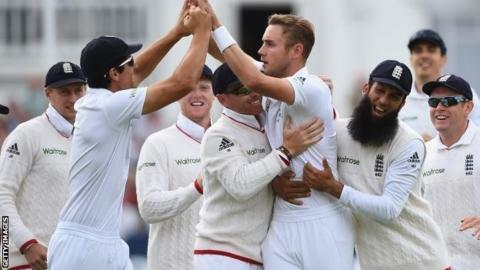 Ex-England spinner Graeme Swann: "When a team gets on a roll, you just expect it. The slips expect to catch every ball. As soon as Australia were five down, somehow we knew that they would be all out before lunch. Everything's gone right for England." Former England captain Michael Vaughan: "You get the odd morning like this in county cricket, under overcast skies. But you shouldn't get mornings like this in Ashes cricket. And England haven't even had to do that much - they've just bowled that fourth-stump channel." Test Match Special's Henry Blofeld: "No script writers - even Sam Mendes in all those James Bond films - could have written this." Former Australia bowler Glenn McGrath: "At lunch you thought it couldn't get any worse for Australia, but it has. It's been the tale of this series for Australia - they haven't adapted to English conditions with bat or ball." Nottinghamshire seamer Broad, playing his 83rd Test, returned England's third best Ashes bowling figures on Thursday, bettered only by Jim Laker's 9-37 and 10-53 at Old Trafford in 1956, and the third-cheapest eight-wickets in Test history. His five-wicket haul is the fastest taken from the start of a Test innings, beating the 25 balls required by South Africa's Vernon Philander to claim five New Zealand wickets at Cape Town in January 2013. "Stuart chatted to me a couple of days prior to this Test and I was a bit too concerned he was focused on getting one wicket for his 300. I was a bit worried he would be searching for one if it didn't come early, but to get that in the first over was clearly a huge release." He has now joined team-mate James Anderson, Sir Ian Botham, Bob Willis and Fred Trueman in England's 300 club when he removed Rogers, and his eighth wicket drew him level with Trueman on 307. Anderson, who reached the 300 mark in May 2013, is England's leading wicket-taker with 413, although he is missing the fourth Test with a side injury. Having made his debut against Sri Lanka in 2007, Broad has played in three winning Ashes series - in 2009, 2010-11 and 2013 - and scored a Test century against Pakistan at Lord's in August 2010. England again showed some top-order frailty as Adam Lyth was caught behind off Mitchell Starc - the sixth time the Yorkshire opener has failed to reach 20 in seven Ashes innings - before Ian Bell was trapped lbw by the same bowler for one. Captain Cook provided a platform with 43 before he too fell lbw to Starc. But Root again looked a class above everyone else at the crease, scoring his second century of the series and his eighth overall to usurp Rogers as the leading run scorer in the series and underline England's dominance. The 24-year-old is the third player in Test history to double the opposing team's score on the first day of a Test match, after Graeme Smith (against Zimbabwe in 2005) and Alviro Petersen (against new Zealand in 2013). He was ably assisted by Bairstow, who scored his fifth Test half-century in his second match since returning to the side in place of Gary Ballance. And finally... what's in a name?